More and more people are becoming interested in joining the world of investments, looking for a better way to do business. However, one of the biggest reasons people are hesitant to start investing in the financial markets is that it is viewed as a type of gamble — sometimes you can win big, but other times you can lose a significant amount. One of the differences between trading and gambling, though, is that trading is the ability to make decisions based on analytical data, and not a hunch or false intuition. While it can take a long period of time to achieve the level of knowledge required to make these analytic decisions, automatic trading — also known as algorithmic trading or algo trading — is a solution that enables people to overlook all their human flaws and just make the most of their money and investments. Instead of basing decisions on hunches or false intuition, algo trading makes decisions based on science and mathematical calculations. Most people know a thing or two about the financial industry and can identify the weakest point of every trader — their personal trading approach, ideas, and emotions. In trading, decisions are often made after long minutes of hesitation or doubt. Trading with algorithms may help you make calculated and reasonable decisions. One of the biggest benefits of algo trading is the fact that every bid made by a trader is based on extensive amounts of data from previous and current trends in the various markets they are trading in. Basically, with automatic trading, each investment made by a trader is based on the information acquired from thousands of similar, previous actions. And while the financial industry is very dynamic, each algorithm used in automatic trading software has undergone extensive testing to make sure it delivers proven long-lasting profits for its users. Automated trading has been proven to be a very responsible approach in the long run, even for those new to the world of investments. Another notable benefit of algo trading is the ability to place a large number of bids at the same time, processing vast amounts of data quickly and without any doubt or hesitation. Since courses of action take place through a computerized software it gives traders a huge opportunity. Automated trading is quick, very quick — literally providing the trader with the ability to be working in many places at once a while delivering the best transactions possible. Additionally, even if some trades will statistically not be profitable, the margins and the computerized risks help ensure that traders always stay on the winning site, earning more profit than what they started with. The fast actions taken by algo trading have had a significant impact on the financial world, increasing the speed of all transactions and making each second count. Trading with the computerized abilities of modern technology has various advantages, both for beginners and advanced traders. Are you ready to begin algorithmic trading? If so, you’ll want to ensure that you find the best investment portfolio management software with automated trading strategies. AlphaDroid, an elite financial investment portfolio management software, simplifies automated trading. 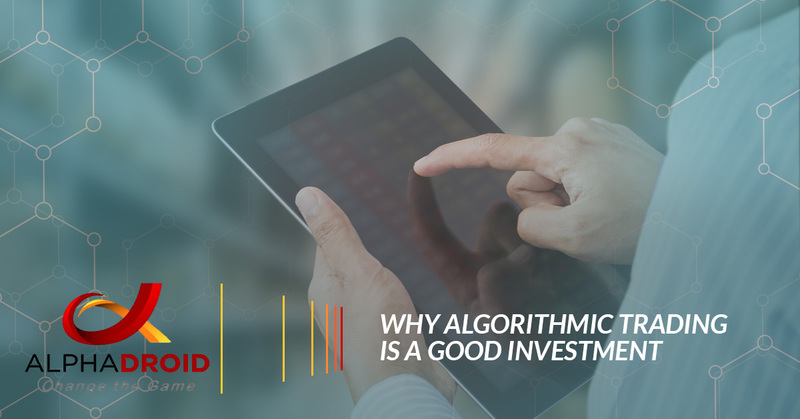 AlphaDroid uses various algorithmic trading strategies to help predict the market by following trends, helping traders reduce risk and promote higher returns. With this revolutionary investment portfolio software, traders are equipped with a systematic and disciplined approach to proactively catch the best days in the market while ignoring the worst. Begin a free trial of AlphaDroid today, and learn why it is a solid investment.